1. The pain that is aggravated by touch AND the movements of the neck or arms can be from increased muscle tension, spasms or strain, rheumatoid arthritis, fibromyalgia, shingles or a fracture of a vertebra or rib. 2. The pain on the inner side of a shoulder blade that is aggravated by movements but NOT by touch can be from a herniated disc in the neck. 3. The pain in the middle back that is aggravated by touch but NOT by movements can be from kidney disease. 4. The back pain that is aggravated by breathing can be from the overuse of the serratus anterior muscle, pleurisy, pericarditis, rib fracture or pneumothorax. 5. The back pain that is NOT aggravated by touch, breathing or movements can be from the heart disease, kidney stones, upper thoracic (T4) syndrome or tumors in the chest cavity. Middle back is the area between the bottom of the rib cage and the bottom of the shoulder blades. Upper back is the area between the bottom of the shoulder blades, shoulders and neck. 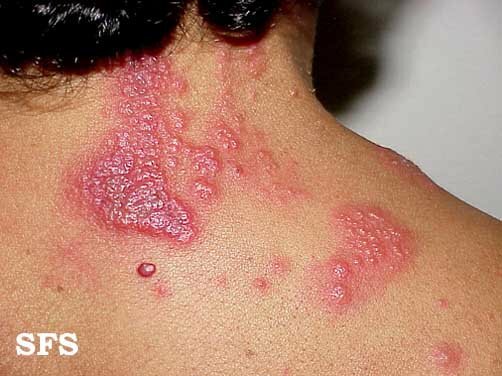 Shingles usually occurs only once but it can recur . Biliary dyskinesia including gallbladder dyskinesia and sphincter of Oddi dysfunction is the pain in the gallbladder or bile ducts in the absence of gallstones; it can appear in the upper right abdominal quadrant, right middle back or tip of the right shoulder. 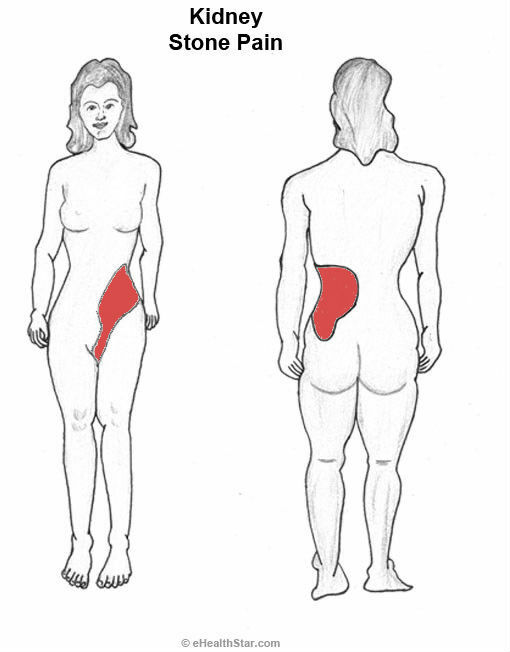 In individuals with irritable bowel syndrome (IBS), gas trapped in the flexure of the colon near the spleen can cause severe pain in the upper left abdominal quadrant, which can radiate to the left side of the chest and left shoulder and can remain constant for several hours or days. The condition is also known as splenic flexure syndrome. Overuse of the serratus anterior muscle due to repeated sprints, prolonged running, boxing or lifting objects with an extended arm can result in pain on the either side of the trunk, below the shoulder blades and on the inner side of an arm (Picture 4). Pleurisy (an inflammation of the lung membrane, for example, due to pneumonia) can cause scratching, knife-like pain on either side of the trunk or at the bottom of the rib cage, and shortness of breath. Pericarditis (an inflammation of the heart sac) can cause pain in the middle of the chest and back; the pain may be relieved by leaning forward and aggravated by lying on the back. A rib fracture can occur during falling or a direct hit; a severe pain on the side of the back is aggravated by deep inspiration; there may also be a bruise and visible bone deformity. Pneumothorax (a spontaneous or traumatic collapse of the right or left lung) can cause a sharp, stabbing pain followed by discomfort around the chest and back; the pain can be aggravated by moving the trunk or arms. According to anecdotal reports, some women experience severe upper back pain in the last days before labor. Lower rather than upper back pain can occur due to hormonal changes, which result in loosening of the ligaments between the pelvic bones in early pregnancy. Rheumatoid arthritis can cause chronic pain in the neck and upper back and symmetrical pain, swelling and stiffness in the joints (finger knuckles, wrists, shoulders, knees, etc.). Angina pectoris is recurring pain behind the breastbone caused by coronary heart disease. The pain lasts for less than 5 minutes and can radiate to the neck, jaw, upper back and down the inside of the left arm; it can be triggered by exercise, stress, heavy meal or cold environment and relieved by rest or the oral drug called nitroglycerin. Fibromyalgia refers to chronic musculoskeletal pain and symmetrical tenderness in various parts of the body, including the upper back (Picture 7). Other common symptoms include fatigue, insomnia and mood changes. No abnormalities can be detected by the laboratory and imaging investigations (X-ray, CT, MRI). Recurring muscle spasms along in the middle or upper back can appear as a reaction to painful underlying conditions, such as a bulging or herniated disc or rheumatoid arthritis. Common cancer symptoms include nausea, loss of appetite and unintentional weight loss. Esophageal cancer can cause pain in the middle of the chest and neck; the pain can be aggravated by swallowing. Stomach (gastric) cancer can cause pain in the upper central abdomen and middle back; the pain can be worse during eating; other symptoms can include vomiting blood and black stools . Liver cancer can cause constant dull pain in the upper right abdomen, the right side of the back and right shoulder, and jaundice. Pancreatic cancer can cause pain in the upper central abdomen, which can radiate to the middle back or left shoulder; other symptoms and signs can include jaundice and a palpable lump in the upper abdomen. Hodgkin lymphoma that affects the lymph nodes in the chest can cause pain in the middle of the chest and upper back, low-grade fever, dry cough and hoarseness. Lung cancer can cause right or left middle or upper back pain before causing any other symptoms, such as coughing up blood. Multiple myeloma develops in the skull, pelvic bones and vertebra, mainly in older people; it can result in the fracture of the vertebra, which causes pain between the shoulder blades. T4 or upper thoracic syndrome, which is caused by the irritation of the nerves near the chest spine, can cause pain between the shoulder blades and abnormal sensations in the forearm, hand and fingers, on one or both sides (Picture 8). 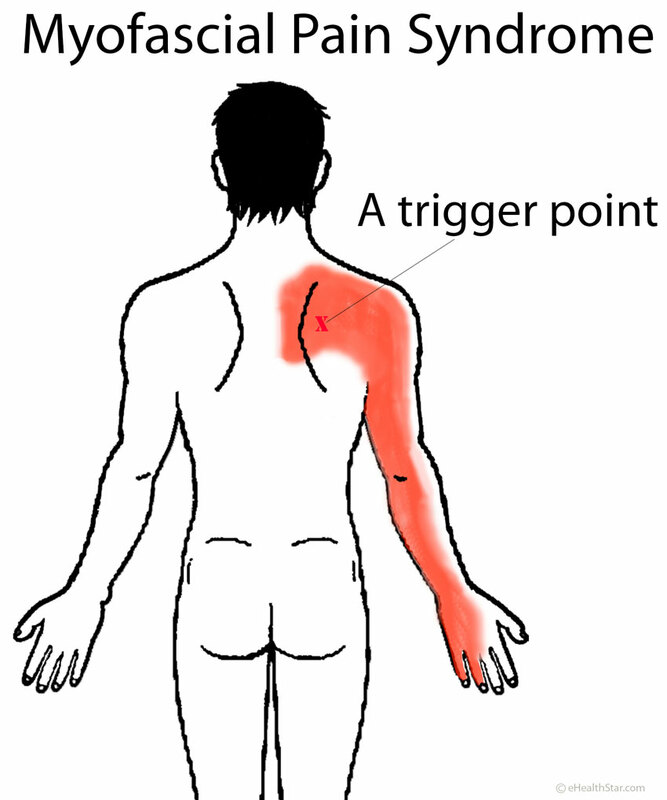 The pain may or may not be aggravated by touch and upper body movements. Transverse myelitis (an inflammation of the spinal cord, for example, in Lyme disease or multiple sclerosis) can cause shooting pain and tingling in the neck and upper back and weakness in the arms; the pain can be triggered by light touch. Scoliosis (a sideways curvature of the spine) rarely causes pain in the upper back. Dermatomyositis and polymyositis (an autoimmune disease that affects the muscles and skin) can cause pain and weakness in the shoulder and pelvic girdle muscles, and rash. Lung tuberculosis symptoms can include pain on the either side of the chest or middle or upper back, low-grade fever and coughing up blood. The treatment of back pain depends on the cause. Stress can arise from wrong attitudes in the relationships and at work. Doing the things in the way you personally believe are right to do, which means being at peace with yourself, can greatly reduce the stress and back pain. If you work too much you may consider taking a break. Cold compresses or ice packs can partially prevent the development of a bruise and reduce the pain caused by a direct hit or muscle strain. Sleeping on a semi-hard mattress can be optimal for middle and upper back pain. Sleeping on a very hard or soft mattress can actually cause back pain. An office chair with a low back support that allows you sit straight but not lean back is probably the optimal chair for upper back pain. A chair should allow your feet, thighs and forearms to be in a horizontal position. Stretching exercises can help prevent pain in myofascial pain syndrome and rheumatoid arthritis . Physical therapy, which can include massage, dry needling, steroid injections and exercises, may help in myofascial pain, bulging disc or rheumatoid arthritis, for example. Over-the-counter (OTC) painkillers, such as aspirin or ibuprofen, can be used to relieve mild to moderate pain, for example, after a muscle strain. Acupuncture is a widely used but unproven method for relieving pain in the back. Examples of conditions in which surgical treatment can relieve upper or middle back pain include pinched nerve in the neck, whiplash, broken vertebra, gallbladder inflammation, coronary heart disease and cancer. I have chronic pain for years In my neck that radiates to my shoulder and arm.I have broken my tail bone and have lower back pain,sciatica with chronic pain. I have crushed nerves bone on bone, bulging discs, scoliosis,degenerative disc disease,osteoarthritis,osteoporosis.I even asked pain doctor if an x-ray,Mri ct would show how twisted my scoliosisi is. I got a big no. I have told this over and over to Doctors yet some how they just concetrate on low back and get MRI for low back. I am on pain meds and got epidurals lasting up to 4 wks. They are freat when they work. Finally they are listening about my neck which has bone spurs that were found in 1991. Still they have not ordered MRI for itbut i got shots in neck to help. I had a pain doctor here who has done nothing too, but concentrate on my low back and sciatica. I am now switching pain doctors. My reg doc was too give me pain meds till the first appt but that has not happened so all the pain is here of the low back,neck shoulder,arm and killer burning pain in my upper middle back with lightening bolt daggers of pain when i sit or stand for more than five minutes. I was never a lazy person always on the go,sports and jobs all on my feet. Now in bed too much. I have though broken many bones falling down wet rocky hillside,fall off back of truck,down story high bales of hay,car accident,sports accidents,etc. I keep looking to see what could be cause of this pain in upper middle back but find everything but. I am 65 and it began in 1991. Any Ideas? I am a 39 year old female and woke up yesterday morning with a dull stabbing pain that radiates from the middle of my back through to the middle of my upper abdomen-lower chest just under the ribs. I spent the weekend relaxing so there has been no trauma or muscle strain. There isn’t a position I can get into that alleviates the pain. It isn’t constant but it happens multiple times an hour. If the pain is new to you and if persists, you may want to go to the doctor again. The pain that comes and goes on its own can be from a combination of bad posture and anxiety, for example. I don’t know if this is your case, but you can try to sit straight, head up (not poking chin), and concentrating on what you do, not on yourself. I have had this off and on for 1 yr now.. it is located in the middle of my back , as the ribs go up ans meet ( in that area) . It’s so painful when it occures. It last for a couple of weeks at a time – it’s a stinging dull pain , that when I stand it hurts so bad I have a problem catching my breath, my heart starts pounding and I have to sit down and press a pillow against my back. I have never hurt like this. It is constant while its there. Went to bed fine around 9:30. Woke up around 2:30 in excruciating pain and shortness of breath. The pain is only on my left side. It feels like it’s under the shoulder blade and it almost feels as if I have a cracked rib. I can feel it from the back and front. It’s very difficult to move, lay down or even just sit still. Breathing hurts. The only thing I can think of is that I fell down a few stairs the other day. That was Friday. It’s now Tuesday. Any suggestions? I get back pain regularly but this is different than usual. Someone help please! One thing that come to my mind is spontaneous pneumothorax. Please go to a doctor. I’m a 25 year old female. I’ve been feeling with upper back pain going on 4 years now. It started as just numbness in fingers every once in a while and over the years it’s turned into numbness tingling and convulsions in my hands and face. I have a constant deep burning stabbing pain starting just under my shoulders up to my neck. Its usually on both sides but sometimes it is on either the right or left. I have had xrays,ct’s, and an MRI done. I have reversal of the cervical lordosa. However doctors say this shouldn’t be causing me pain. I’ve been prescribed NSAIDS, and muscle relaxers and nothing seems to work. It is now a constant pain that worsens with any activity. I can’t wear to tight of a bra or I go numb in my hands and face. Tried physical therapy and it made it worse. Doctors aren’t taking me seriously anymore saying that I seem perfectly healthy. Please help!!! I have a cold or possibly flu, but quite mild since I’ve been using multiple home remedies (colloidal silver, alkaline gel, apple cider vinegar with cayenne, etc.). The past two days I’ve had intermittent pain (an occasional throb) in my back close to right shoulder blade and a side pain (also on right). They’re worse when I’m lying down, so this morning I thought I’d go to Urgent Care. Once I got up and started moving around, however, the pain lessened in frequency so I decided to wait. Could this be related to the flu? Hello, I’m a 23 year old female studying Architecture (A lot of desk and computer work), I’m 171 cm tall and I weigh 48 kg. Late June of this year, I have started noticing mild pain/discomfort in my upper left back, between my spine and shoulder blade. I don’t remember doing anything extreme to cause this pain. I decided to get a massage in hopes of relieving the pain, but after the massage the pain gradually increased. A week after that the pain was sharp and unbearable, it got worse by taking a deep breath or sneezing and I also felt the pain on the same area but in my chest. I applied a muscular balm on my back but it did nothing, I took hot baths, also nothing. But then I started applying pain relieving ointment every night for a week, the pain then gradually turned into mild discomfort with time. Fast forward to today, I have not applied the ointment since then, and the pain, again, gradually became sharp and excruciating especially right now as I’m writing this. It is made worse by looking to the far left, bending my head downwards to the left making my ears touch my left shoulder, pressing my shoulder blades together, pressing on the pain itself, sneezing, coughing, taking a deep exhale and deep inhale. What I’m feeling now is a sharp pain in my upper left back and a strange sensation in my upper left neck area, it’s not painful, but it’s nothing that I’ve felt before, it’s quite the cold feeling. Please help me with this issue! I have a bulging disc in my cervical spine and those are my symptoms. I’m currently being treated with physical therapy in hopes that the inflamed disc and the nerve it is touching will heal. If it doesn’t there are minimally invasive surgical interventions that are proven to work. Hope you feel better soon. Hi, I’m a 24 year old female and I have been experiencing excruciating pain in my upper left side of my back somewhere between my spine and my left shoulder blade.. this has been going on for about two months now, before I couldn’t even turn my neck or raise my arm without getting this Sharp stabbing pain in my back and it was so bad I would feel it in my chest.. now it has eased up a lot but when I lay on my left side it starts hurting again so this pain hasn’t left me since and I am worried it’s something more serious because I overly worry about my health so I’m always going to the dr and in the Caribbean their fees are really expensive and it’s taking a toll on me financially… When the pain was really bad at first I went to the doctor and he told me it’s muscle strain, he put me on nogesic for a week, I took the dose but the pain isn’t fully gone yet.. any ideas on what it could be?? Such pain usually arises from the chest wall (muscles or bones), but can be also from the spine or spinal nerves. I strongly recommend you to ask your primary doctor about a referral to a specialist, such as a neurologist or orthopedist in order to prevent unnecessary complications due to delayed treatment. I assume it’s where my kidney is, but I went to the hospital and they did a urine analysis and said I didn’t have kidney stones. It’s not really touch sensitive it’s more like a dole pain over kidney area. Imean not getting any type of sleep. What could it possibly be? The most common pain in the kidney area is muscle pain. Muscle pain is usually aggravated by touch or body movements or both. Kidney pain is less likely aggravated by touch or movements. Apart from kidney stones, there are several other causes of kidney pain. One of the first investigations that can suggest the cause is an ultrasound. It is a doctor who can tell you what can be done. The most common cause of such pain is increased muscle tension due to poor sitting posture or excessive exercise. I am a 25 y/o female. 5’3″. Over the past few days I have been experiencing severe back pain. I do not know if it it a pinched nerve or kidney stones, but it is my lower to middle left side of my back. Pressure against it helps me breathe, but nothing helps. Lidocaine patches do nothing, oxycodone does nothing, hydrocodone does nothing, tramadol has done nothing. Nothing is helping. My Dr said to take up yoga… but it hurts to breathe let alone move.. It’s taking a toll on me. I work 10+ hours in an auto shop (mostly computer work). Here’s a chart that may help you distinguish between kidney pain and other causes of back pain. Pinched nerves are not common in that area. The most common cause of such pain is muscle tension. Few days off work, some walking and stretching exercises may help. If not, you may ask for further investigations, such as an X-ray of spine. Hi before 3 days I got a upper right back pain when I work and moving .. when I take rest no pain..!! But by hitting on that place I didn’t get hurt.. I think their has no infection and broken Bron.. but why I got pain as I do smoke and I joined this job since month back but before 3 days back ithe pain started.. during night while sleeping no pain at all..!! At morning when I start work the pain also start.. I don’t know whether it’s a major or minor problem..!! Please guide me..!!! Exact location, upper right back only.. no arms pain, no kindly pain, no pain in spinal cod.. only pain on that location..!! Waiting for the kind reply.. thank you..!! Such pain can be from a muscle strain, increased muscle tension or myofascial pain syndrome, for example, but I can’t just say what it is. It can help to find a cause if you visit a doctor until you have pain. I have short sharp pain across the upper thoracic just below rib cage mainly right side. This happens sometimes when lying in bed and then trying to move. On standing from sitting and reverse. Miss stepping or a jolt on walking. It does occur all the time. Spine feels like it’s squashed and pinching. No leg or arm pain. Hip a bit stiff. Have trouble lifting right leg into car. Some days legs feel weak and tingle and pain on standing. Have to hold standing position for a few seconds before trying to walk.Once walking.It’s all good.I’m 54yrs old.Fell onto a step many years ago hurt a lower area of my back.Do cleaning for work.Have been diagnosis with degenerative back. It’s very painful and takes my breath away. Such symptoms can occur due to a herniated disc in the lumbar and possibly in the thoracic spine. I strongly recommend you to visit a doctor, who can say if any treatment is necessary to prevent permanent damage. Hi. I am 54 yrs old. Light smoker. I have been having pain in the mid area of my back on right side. It started after I got in a cold pool and it is sharp stabbing pains. It happened before a couple of years ago but went away after I got out of the pool. Now it is getting worse. Almost every night I get pain in my middle chest and upper back between the shoulder blades. This happens when breathing and if I breath very small not deep breaths I don’t get as much if any pain. This has been causing me to not be able to sleep very good for over 4 months now. Mentioned to doctor which sent me for a C.T. scan of chest, back and abdomen which came back normal. During the day after sitting up or standing the pain goes away, but almost very night or early morning I have this pain again while laying down. Doesn’t matter if I’m on my side, back, stomach I still get the pain. If I take a deep breath I will get the sharp stabbing pain in my middle chest/ribs and then if I keep breathing in I can pass the pain, but then will get the pain afterwards on the exhale. Very annoying pain that makes it hard to sleep or even wakes me from sleep. Forgot to state that I’m a 35 year old male 5’6″ and that recently after a diet change about 4 months ago I lost 33 lbs. Started at 163 lbs and an now hovering between 127 to 133 lbs. The diet change was due to a fatty lump found in my liver and high liver enzymes found in my blood. Not sure if this is connected but wanted all the facts to be given none the less. Is there any part of your chest or back tender to touch? Is the pain affected by bending or twisting your torso or moving the arms? I am 28yrs old… fashion designer… I sincerely do not know the cause of this pain… it’s really painful around my upper right back towards my neck. Been taking pain killers but it doesn’t seem to help a lot. Such pain can result from something as simple as increased muscle tension, for example, due to poor posture, or from a herniated disc in the neck, for example, due to repetitive bending or turning the head. I’m a 48 year old woman, non-smoker, with a list of problems, including: Fibromyalgia, lipid myopathy, spinal stenosis, arthritis in my neck, carpel tunnel, & tendinitis. I’ve been in pain 24/7 somewhere in my body for the last 13+ years. The Fibromyalgia was bad enough, but after unexplained, progressing weakness in my legs & arms I was finally diagnosed with lipid myopathy ( my body is storing fat in my muscles). Nine days ago now, I woke up with very severe pain in my upper left to middle back. I have done nothing to cause this as I don’t go out except to appointments and I hadn’t done anything recently at all. No falls, strain, bumping into anything, NOTHING. It is some of the worst pain I’ve ever had and it feels like there is a large rock in my upper mid back, especially if I’m lying down. At first I kept getting up and checking to see if I was lying on something like the tv remote or something but I wasn’t. I went to urgent care on the third day and they didn’t know what to do for me. They gave me a shot of Toradol which didn’t help at all. If you look at the picture under #6 Back Pain During Breathing that says Serratus Anterior Muscle Pain, the small red marked area is exactly where it hurts. It hurts constantly and gets even worse with touch. It feels like there should be a large bruise or lump there but there’s nothing. Someone else described their pain as someone trying to push a broom handle into their back and that is a perfect way to describe it also. I can’t take this pain anymore. Is it sensitive to light touch? Does it help if you place the left hand at top of your head or to the back of the neck? Any tingling down the left arm? I have this too. And I actually have a bump you can see in that precise upper left spot in the back. Lifting the left arm doesn’t really help nor touching the back of the neck. It’s a stabbing pain, which sometimes burns and it comes through and to the front on the chest area. Has been going on for months and gotten worse instead of better. At the worst, I say it feels like an arrow on fire piercing me from the back to the front. Please help figure out this mystery. Oh, nothing of value has come up on X-Ray or CT-Scans. I have a couple of instances that I felt a sharp pain in the heart area. Felt like something passing through the heart. When lying down the pain has made my body jump and then the heart area is sore for close to a week. It’s been three weeks since it started. I’m a 37yr old mother of two. I smoke. 5″3 and I weigh 78kg. It started one morning when I woke up and it was there. I don’t know if it was exertion or my sleeping position. Went to a pharmacist eventually who prescribed anti-inflammatory pills and something else that knocks me out(don’t take that often because of work). The pain reduced for a bit but then it came back. I kinda got used to it but not quite. I read somewhere yoga might help. Bad idea. Tried that this morning, not as hard as I thought but when I was done I couldn’t get up. I can barely sit up to type this. Took one of the a.i pills an hour ago but no luck. What can I do? This pain is killing me and a doctor would murder my pocket. – Where exactly is the pain, for example in relation to the shoulder blades? – Does the pain radiate down the arm? – Does lifting one or both arms above the head relieves or aggravates pain? When I lift my arms especially in the rite side the pain is real sore I also have fibromyalgia. This pain appears two days ago. There are tests a doctor can perform to check for eventual nerve involvement. I’m a 39yr old smoker with mild copd. I have been diagnosed with spinal stenosis, bulging discs, and severe arthritis especially in my lower back and hips. I am seeing a pain management doctor and have meds to get thru each day. 3 days ago while out with my family I started having severe pain pain radiating from the middle of my spine out and even around to my ribs. Even breathing deep hurts. Nothing is helping and I’m too the point of laying in the floor in extreme pain. I should also mention I have heart issues, basically the electrical system is jacked up and it beats to fast and skips. I have had pvc, vt, afib, and had an electrophysiology surgery with ablation but the issues were spread thru the entire heart so not able to fix it. I take an alpha/beta blocker daily. I don’t know if this is something I should be going to the er for now or just talk to my doc in a few weeks when I go for a checkup. I’m going out of state for a week in 2 days and I am miserable and pain meds not working. I am also having the pain go down the under side of my left arm down to my ring and pinky finger. Is there anything that I can do for relief immediately? Pain on the inside of the left arm can be from the heart. You should tell this a doctor. You may want to reconsider having a trip. I woke up fine one morning. As I went to put my T-shirt on, arms up, I felt a sharp pain on my back, around where my ribs end at the spine. Felt like a bad muscle cramp. After that, all my middle-back muscles tensed up and really hurt when I twist my torso. Coughing and sneezing hurts the back. Lowering my chin towards my chest hurts. Laying on my stomach hurts. The only way nothing hurts is laying flat on my back. The area of most pain seems to be on both sides of the spine, at the lower end of the rib cage. Does this sound like a spine issue or muscle issue ? Despite your detailed description, it could be too misleading for me to try and judge about this. Is the pain in the upper back, near neck or in the middle back? Pain after putting a shirt on is most commonly due to a stretched muscle. Spinal pain can be caused by a vertebral fracture and this could occur in severe osteoporosis or vertebral cancer. Pain from a pinched spinal nerve in the neck can be felt in the neck, between the shoulder blades and upper arm, usually only on one side. The nerves in the thoracic spine are very rarely pinched. I’ve had about 4 weeks of a very tender when touched focal spot on my right, mid back . It hurts even when I lie down, as well as in the morning. My back looks swollen on the right side as well. Does this sound muscular? I have not injured it. Such pain and swelling can be muscular but it is unusual that it lasts for 4 weeks already, so you may want to see a doctor. There are other structures that can be affected, such as bursae (soft, fluid-filled sacs between the bones and tendons), for example. I woke up 2 days ago with discomfort/tightness allaround my upper back around the front under my ribs. Like a band around me, hard to take full/deep breaths. After Ibuprofen I feel normal, but it comes back when the pain reliever wears off. I am seeing my provider in 2 days, should I wait that long? I’m feeling anxious about it. I should add, I am a 45 y.o.female non-smoker. I am diabetic. Do what you think is best in your situation. My husband has sudden intermittent stabbing pain in his upper back, right side. It usually happens when he is not moving, just relaxing, like watching TV. When it happens he literally jumps from his seat or cringes severely. He can direct me to the exact point where the pain is. I don’t know what to do for him. He is 43 years old. What is it – muscle, bone, tendons, something from inside? Such pain usually comes from the outside, for example from the muscles. He may want to get checked by a doctor. I was taking Cymbalta but had bad side affects. I also was on lipisene for high blood pressure and developed a cough, also hydrocodone 1 every 4 hrs for years due to spinal stenosis and neck survey 4 years ago. A month ago my doctor’s PA cut me off cold turkey (didn’t want to lose his license) but my PA and I were all ready working on getting me off of hydrocodone so I had mild withdraws, Cymbalta was worse. Since then I’ve had 2 cortisone shots in my lumbar 3 and 2. But after first I developed a constant pain in my right mid to upper back also u see my right rib which that’s been on and off since Cymbalta. I also have the cough PA thinking it was from NO meds. Pain doesn’t hurt when I breathe but when I move or if accidentally I hit my arm/shoulder on a door or jamb, it’s excruciating pain. It feels internal too. My PA said it was from the trauma I’ve gone through but it’s been one month off hydrocodone, 6 weeks Cymbalta and 2 weeks BP meds. Any ideas? As I sit here with a heating pad the pain intense from my kidney area to mid back to almost shoulder area not near spine. You can discuss with your doctor about the correction of spinal stenosis and eventual herniated discs in the neck. Osteoporosis as such does usually not cause pain, but fractures in the vertebra caused by osteoporosis can. I strongly suggest you to get your spine checked up by a doctor. Smoker 35 yrs? feeling like cold coming yesterday, this am I woke up with sharp stabbing pain upper right back with all breathing or movement but no fever? I’m scared, no insurance to go dr.
Not sure if I should make an Uninsured trip to er? I can’t decide instead of you, but this can be a potentially dangerous condition, such as a spontaneous pneumothorax. I have a recurring episode. The first time it happened I was washing dishes and it felt like someone was grabbing me from behind, around my chest, so tight it hurt to breathe. I stiffly walked to my husband who helped me sit on the edge of the bed and laid me down. We went to the ER, they said anxeity was the cause. It’s happened twice since then. The last time was early this morning. Laying on the couch with my daughter (1 yr) I got up to put her in the crib. While standing up with her in my arms it hit me. A tight band wrapping from my back to my chest. It’s uncomfortable to breathe, twist, bend, but not excruciating. Any idea what that could be? My neck also has a catch in it when I lift my head. That’s been happening for over a year. Anxiety resulting in increased muscle tension can actually be a cause. If you are worried you may want to visit a doctor who can investigate if there is any underlying organic problem. During my first pregnancy I started developing a horrible pain in my upper right (between my spine and scapula) back. It literally feels like someone is stabbing there with an ice pick. After pregnancy I didn’t notice it for a while, but it has started coming back again. I usually have my husband lightly (and repeatedly) hit me there and eventually I will burp up foam…I know, gross, but if I don’t do it then the pain is unbearable to where no position is comfortable. The last month or so I have noticed that sometimes when I bend over to pick something up that same spot will have a sharp pain for just an instant. I thought it was just pretty bad acid reflux, but I am paranoid that there may be more to it. Any ideas? A doctor can tell after a physical examination. Hi I started with a nasty urine infection and pains in my left rib, the pain was that bad I lifted my shirt a little to show my collegue at work and to ask if there was bruising or a mark. I have not had an accident or lifted anything I shouldn’t have. Then these pain have moved around my body and into my upper back and neck, when I breathe it sends shooting pains threw into my chest area. My left arm tingles sometimes at night. The pain is constantly with me and doesn’t really ease with pain relief. Been to docs and physio and they are baffled. So awaiting blood test. It’s really scaring me I’m only 31 with two children. Shouldn’t really be having these pains at my age, I’m preferably fit and don’t need physio. I’m an healthy weight, just wondered if anyone could think what it could be or should I not worry too much and just wait for the bloods to be done. While waiting for test results, you may want to write down the exact course of your symptoms in a time manner and where are the exact pain locations and what exactly triggers or relieves pain. Such info can greatly help the doctor to narrow the causes down. Leg swelling may be heart- or kidney-related, for example. A kidney stone can block the ureter and thus the urine flow, which can result in the kidney enlargement. I strongly suggest you to get this checked by a doctor. An orthopedist should be able to give you a diagnosis. Maybe an MRI will be needed. It seems reasonable to visit a primary doctor first. If it is a neurological problem (and I’m not saying that it is), it is then a neurologist who can tell more, but your doctor need to make a physical examination to determine this. Can carrying something too heavy cause pain in the upper left back? I went to the gym 3 days ago and pain has just started, I can’t sleep because pain is getting unbearable. Can heavy bags cause this pain? It can be just the very well known delayed-onset muscle soreness. Or a stretched tendon. Hi my name is Quinton I’m 27 years old. I’m in great shape. I workout. I’m active. But ever since I’ve gotten out of high school I’ve had times throughout the year(s) I’d have to pop and pop and pop or use a hard round object to rub out this knotted tense spot. The spot if your looking at my back would be maybe three four inches below left shoulder blade or 9 oclockish if that makes sense. For me to feel better I pop my back, or lay on a flat ground or receive a poor back massage. Or if saying it feels as if someone is trying to push shove ram a handle part of a broom stick through my back (upper left side but below shoulder blades they feel fine. 1. If the knot is visible and it feels like a knot and disappears after manipulation, it may be a muscle knot associated with myofascial pain. Such knots can develop due to excessive training, repeated forced movements or bad posture. The best treatment for this is avoiding the triggering activities. 2. The knot could be associated with a shoulder blade misalignment. An experienced physiotherapist or orthopedist can help you. Hi i have bad pains in my upper left and right side of my back and sometimes the middle. It moves around. I use to have server back spams a few years ago but it went away and now i have bad back paons that moves alot. The past 6 months ive been really sick one point i couldn’t eat but that was due to really bad anixty. Where my stress level is up my back really hurts. Ive had loss of appetite and my stomach has been really upset diarrhea. Really bad acid reflex. I just been really sick for the past months and just seems to get worse especially when i worry alot, but thats because im scared. Such back pain can be from increased muscle tension because of the worries, acid reflux or as a reaction to pains in other parts of the body. I can’t exclude other conditions, though. I am a relatively active 42 yr female with 6 hrs of exercise a week. Have had occasional oil floating in my stools-sometimes excessively but goes away. Recent development of left upper flank pain just below and under last rib. It goes to the back like a dull boring pain. Cannot lean back or touch the back there-it hurts like there is a tennis ball there but there is no swelling. Worst when lying down. Its good to keep back stiff straight leaning a little forward while sitting. I am losing sleep with the pain-its very uncomfortable. I often have constipation but not currently. Bowel movements do not help. Have been iron def anemic in the past but fixed with iron infusion. Have arthritic pain in finger knuckles and in knees. Thank you for any advice. Jay, the pain location just below the lowest rib in the flank suggests a problem with the left kidney. The oil on the stools do not seem to be kidney-related, but could be from fat malabsorption and this could be from a liver or pancreatic disorder, for example. Muscular pain is usually aggravated by touching. I suggest you to visit a doctor. I’m 43 and just started working out 7months ago (2 hours on the elliptical at least 5 days a week) for the last month I’ve had a sharp stabbing pain in the middle right side of my back (not near the spine) I originally thought muscle spasm from exercising it hurts worse during the night when I’ve been lying down but I still get up and go to the gym, it calms down while I’m awake and moving but still hurts like crazy. It starts with a contraction like pain that takes my breath away. Any idea what could be causing this pain? Feels like someone has a Vodoo doll of me and is enjoying stabbing me while I sleep!! I have pain in the right side of my upper back,right next to, or below my shoulder blade. This only happens at night, it wakes me up, or I feel it shortly after lying down, and cannot fall asleep at all. This feels like a stabbing, aching feeling. Melissa, you can visit an orthopedist. Such pain is usually from the muscles or tendons around the scapula, but can’t exclude other causes. 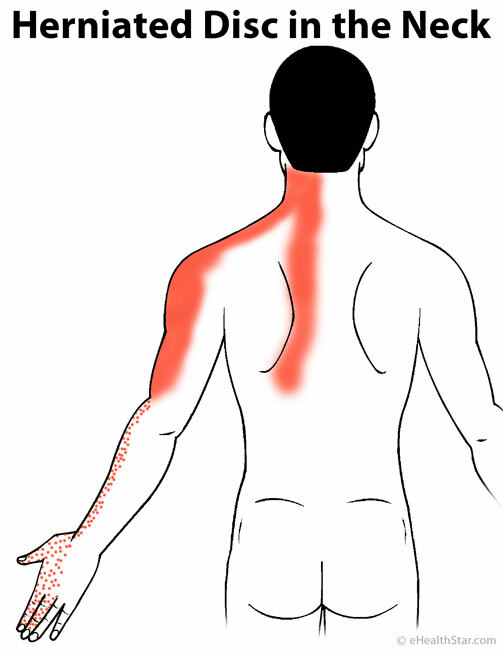 Soroya, the most common pain in that area is from the muscles. The left kidney and spleen are also there. Pain from base of skull to base of spine, numbness on right leg below knee and off and on right arm. Almost passed out from a shooting pain down my back. ER took CT scans and low back X-ray. That same day felt like my neck was so stiff I could barely talk or turn my head. Could not find anything from CT scans/x-rays was told it could be muscular. Refered to neurologist who looked at scans said nothing wrong with spine but did not look at muscles and said to try physical therapy. Feels like pain is getting worse everyday and having trouble getting comfortable enough to sleep. Was diagnosed with celiac earlier this year, had a cluster of headaches for a month which are no longer present thankfully. Seems I’m also quite thirsty despite that i generally only drink water. Thoughts? Monica, the numbness as you’ve described it is often neurological. You may want to insist and show the CT scan image to another neurologist or ask if an MRI image would be appropriate to do. Numbness that arises from nerve disorders is real numbness – you actually feel that part of the body less than on the other side. A neurologist can determine this, but this would probably work only when you would feel the numbness at the time of the visit to a doctor. Tingling, which may be experienced similar to numbness can arise from increased muscle tension or even from stress. Please use your best intuition and if something is telling you it could be from the nerves, ask for more investigations. Hello I have had on and off pain which feels like muscle pain on the left side of my spine between the shoulder blades. It goes away with ibuprofen and feels better with massage. I have had horrible posture my whole life and now I’m worried that I can’t fix it and this is what is causing all my pain. Alyssa, yes, bad posture can cause such pain. You may want to ask a physiotherapist for an advice. Hi, I have the pain in the picture above under section 6 “Picture 3. Serratus anterior muscle pain syndrome” except that the pain is in my upper back not the shoulder. I feel this pain when i breathe and i find it even more difficult when i move my upper body to the left hand side. Although I had flu around Christmas time, the pain started way before then around early December. The pain intensifies when i bend or take a different position or even lift anything heavy at all. Could it be the Pleurisy or Overuse of the serratus anterior muscle as described above? Bimbs, do you have any reason to be serratus muscle overuse (repeated running, lifting heavy objects, boxing or other exercise involving the arms)? Pleurisy is usually associated with coughing and possibly fever. It could also something other. Hi! I have a pain in my lower neck and upper middle back it is almost 1 week it is very painful,,I’m only asking what it is?because I work in a garments I stand there for 8hrs. Is that cause of a poor posture?pls.i need your answer and what is the medicine for that pain? Cherry, such pain is mostly from increased muscle tension due to bent neck (I suppose). I’m not sure if a medicine will help just like that. Okay. Have not experienced this before. feels like a kidney stone but its up to high for that. Right side upper middle back. pain is constant and dull but sharp at times just like a stone. I’ve had this for over a week. Vince, a kidney stone lodged in a kidney would cause pain around the bottom of the rib cage in the middle back. The most common cause of sharp pain in the upper back is muscle strain; it can occur after a minor incident, such as reaching for something on a high shelf. In this case, the painful area would be tender to touch. If the area is not tender, the pain cane be from the lungs, for example due to an inflammation of the lung membrane – pleurisy. If you don’t think the pain is from muscles, I strongly suggest you to visit a doctor. Breanna, I suggest you to go to a doctor, who can actually help you. Susan, a doctor can make a physical examination and tell what it is. Increased tension in the muscles or herniated disc in the neck can cause such pain, but other causes are possible. Sue, it is a doctor who can tell what it is – it could be heart-, lung- or spine-related, for example. Constant pain for over a year now in my left upper middle back …seems to be internal but makes me uncomfortable after sitting a while……help! ose Baby, upper left back pain that worsens during sitting is more likely from the muscles or joints than from internal organs. You may want to see an orthopedist. Angel, you may want to see a doctor. I have been getting these chronic sharp spasing pain in my middle right back area . I am unable to lay, sit or any kind of movement. Doctors have run test, they ruled out my liver or kidney. My white cells are a little elevated, I have been nauseated for 2 weeks now and unable to enjoy my food. Right shoulder is stiff. Rose, you may want to get your shoulder checked. Hi sir i m ganesh my back pain opretion is over 2month ago then so my back pain problem is left side up & right side down..what is he problem? Ganesh, what exact operation did you have? i have had severe upper back pain for years, the pain is on both sides of the center spine, severe pain when applying pressure on that area cause the pain to be so severe i almost pass out.. can not move.. i can not take it anymore and have considered taking my own life at times. it is that bad. Michael, it can be arthritis in the spine or a pinched nerve in the neck or something else…I can’t say from here what it is. A doctor can examine you, give you a diagnosis and tell you for appropriate treatment. Hey, in the last few years I’ve had a couple of times when a sudden sharp pain strikes me either on the upper part of the back or the ribs. It can happen without any movement even when I’m sitting. I had to leave work 2 times because of this. The first time the pain was right in my chest near the heart on the left and the second time was at the lower right ribcage area. It happened to me this evening, I was trying to pick up something from the floor and the minute I got up, I felt like there was something squeezing me in the upper back area. I could bearly breathe and walk, all I could do was go to my bed and lay down. The pain subsided within 10 minutes and I did a little bit of stretching. There were times when it got better after 30 minutes of laying down but when I had to leave work I took the next day off because it was stronger. I was just wondering, could this be an issue with my nerves, is it possible that they get pinched easily? I’m 21, work in an office, I walk as much as I can, I like to run and go to the gym sometimes, I don’t have any other issues whatsoever, so I’m pretty healthy. Suzi, pinched nerves do not typically cause pain in the upper trunk, but rather in the neck, lower back or limbs. The pain, as you’ve described it, is also not typical for muscle strain, but I can’t exclude anything. You may want to go to a doctor and ask if there is any problem with your heart. in 2014 I was diagnose to have a pneumonia III. Is it possible that it will come back?, i asked because i have this feeling which i was feeling before when i was diagnose..upper middle back pain and itchy throat with dry cough..
Reymar, pneumonia can appear again if you have some risk factors. We have several articles about pneumonia; links to them are here. Hi i am Alex 36 years old. I have pain on the right side of my neck which has spread to my right arm and upper back. The pain started 3 weeks ago from the left Side of my neck and moved to the rightside. I have taken some anti inflammatory drugs but no responnse.whst could be the problem? I have no pain in my upper back muscles until I get up to go to the restroom in the middle of the night. As soon as I get up my upper back muscles begin hurting. The pain eventually goes away as start the day, but the pain often keeps me from going back to sleep. This problem only started a few months ago and I have slept on different mattresses to no effect. I don’t know what the problem is, let alone what to do about it. Any hep will be appreciated. Bill, you may want to get this checked by a doctor. It may be some problem with vertebra, for example. I am having pain going from there front right immediately under the breast going around to the back all right hand side very similar to when I had a gallstone problem but I had that removed as well as my gall bladder ?? Adrianne, pain similar to gallstones that can persist after gallbladder removal can be due to sphincter of Oddi dysfunction or biliary dyskinesia. Paulette I can’t comment something what may be a medical emergency. Please, see a doctor. I have pain at right side middle back and serve more as day past. and at night time it worse some days and sime days feeling like pain. No pain after sleeping and morning time. 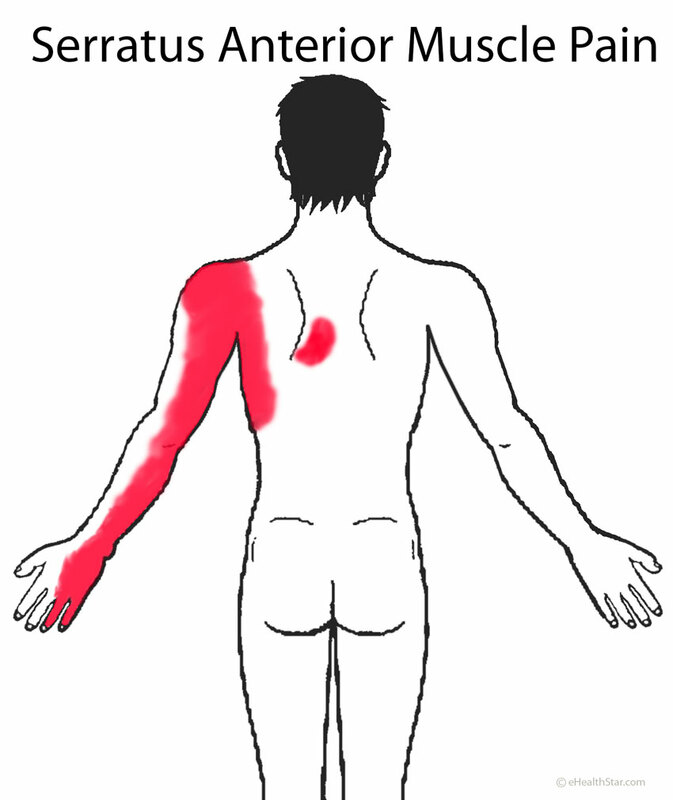 Pain location near lower trapazius and feeling pain since 20 days. Jack, too little info for me to comment. You may want to see your primary doctor, first. For about 2 months now, I have had a constant nagging pain in my right upper back between the spine and the lower end of my shoulder blade. The spot is tender whenever pressure is applied to it. The pain came on suddenly one day. I visited my GP and he told me it could be a muscle strain but I’m starting to have doubts. I also sometimes get pain- nothing too intense- along my entire right side and experience weakness in that arm as well, in that it gets tired easily. I also have cramps on the right side of my bottom and pain in the right leg sometimes both. No loss of appetite, no weight loss but I do feel very hungry about two hours after eating. The pains eases a bit after I eat and gets worse when I’m hungry. Liv, a painful spot in the upper back that is tender to touch can be from muscle strain, tendonitis or a pinched nerve in the neck. You may want to arrange an appointment with an orthopedist. Overuse of a muscle on the side of the chest, called serratus anterior can cause pain in the side, shoulder blade and arm, as you described. You can read more here. Causes include repeated arm swinging, lifting heavy objects or a direct hit to the side. Helion, I can’t give any advice how to deal with acute severe pain. Please go to a doctor. It can be muscle strain, pleurisy, kidney stones, etc, but I can’t just guess what is it. I have the pain when I wake up in the morning and it’s in the middle on the left and right side of my back and it hurts when I breathe but it only lasts for a few hours after I’m up. I have had back surgery probably 15-20 years ago I had my L5 taking out but this back pain it’s different it’s just in the left and right spot not all the way across my back. Mike. I don’t know, but increased muscle tension, possibly due to bad posture) may cause such pain. I woke up this morning coughing up blood and severe left side middle back pain , what should I do ? Has anyone had this problem and know what it is ? Amy, coughing up blood can be a symptom of tuberculosis or lung cancer for example. Please, go to the doctor soon. I just woke up with severe pain in my upper left back, it pained when i am resting or laughing or even having a deep breath. Though for normal breading, it doesn’t pain and when sitting though sometimes it attacks even when i’m still. Dan, please go to the doctor. I don’t know what it is, but such pain can occur in pleurisy or spontaneous pneumothorax, for example. Back pain on right side of waist (muscle side).Cause and what should i do . Rinju, if you think it’s not just from muscle overstretching, you may want to visit a doctor. The pain may arise from an internal abdominal organ. I have has excruciating pain between my lungs deep inside my upper back, but more to the right,It started 16 years ago, and I had it about once a year, for the 1st few years. The pain was so extraordinary that I never forgot it. Then it came several times a year, after that, about once a month, now its almost like several times a week. What could this be? Arsheia, I can’t quite imagine what kind of pain do you feel? Is it sudden, how long does it last, does it change with the body position? Hi. I am having pain in my left side back starts at the end rib cage and it moves towards buttock. I am suffering from infection taking antibiotics Zanocin 200. Syed, the distribution of pain as you described it can occur in kidney stones or other kidney-related disorder. As my utologist says stone shouldnt be forming for atleast 2 years from the day of PCNL surgery. And i am getting this pain soon after i started taking Antibiotics. Syed, the pain could be associated with the antibiotics’ side effects. Some antibiotics can cause kidney inflammation without causing kidney stones. Kidney inflammation can also cause pain. I suggest you to discuss with your doctor about having some kidney tests. One more thing. I was prescribed antibiotics because i was having discomfort in my gentle area. Urologist prescribed me antibiotics for 5 days. And soon after i started having antibiotics i started coughing with pain in back. Today is the last day of my antibiotics duration. Such reaction can occur next time when you take the same type of antibiotics. You may tolerate other types of antibiotics well. Hi, I have a back pain on the left hand side just under my shoulder plate and it only feel painful when I’m lying down/sleeping. Could it be heart issues? Mathema, I can’t exclude anything, but it does not sound as a heart issue to me. In coronary heart disease, the pain called angina pectoris is usually triggered by exercise or other stress and typically lasts for less than 5 minutes at the time. Pain in pericarditis (inflammation of the heart sac) is typically aggravated by lying down and relieved by sitting and leaning forward, but you would very likely feel such pain behind the breastbone and between the shoulder blades rather than below the left shoulder blade. The most common cause of localized pain around the shoulder blades that changes with the body position is increased muscle tension or muscle strain. If you are worried and the pain persists, please see a doctor. I have a dull pain in my back on the right side by my ribs. Edith, it might be acid reflux, but this would cause pain more toward the middle back line. Pain triggered by coughing can be from pleurisy (inflammation of the lung membrane) – even if you do not have any fever – especially if sch pain is new to you. A doctor can tell more after listening your lungs by the stethoscope. I have a slight left upper back pain towards my chest, and something moves from the back towards the chest, when it happens the left back pain tingles, what could be this disease and what causes it? Fatuma, tingling suggests it may be a neurological issue, maybe a pinched nerve in the spine. A doctor can tell more. Hi I woke up yesterday feeling bad mid back pain on the right side(I also have had a bad cough for two days if that matters). I always move from side to side when I sleep and when I woke yesterday with the pain it hurt to move either way almost felt like I needed to apply pressure in the area to move. It continued to hurt all day like a dull pain and I would notice it more when I would try to lean over and get this sudden sharp pain. I feel like it has worsened over night as my back restricts me from sleeping and moving in any position without a sharp pull of pain. When I breathe or stretch I also feel pain. Asia, cough + back pain worse during breathing can be from an infection/inflammation of the lung membrane (pleurisy), for example. I suggest you to visit a doctor. Thanks for this blog. I have this pain in my upper left back, just bellow the scapular. The pain is constant. I have taken NSAID and other OTC pain reliever to no avail. I was initially treated tor PUD radically but with no changes. I had at one time or the other also placed on clopidogrel, naproxen, propanolol, amitryptyllin, and adequate rest for a one full month. My Wbc is 5950cells/mm³, neutrophyl 34%, Lymphocyte 63%, monocyte 3% Pcv 49%, RVS negative, liver function test was normal, e,u&cr was normal, abdomino-pelvic USS normal except right ectopic kidney, lipid profile: LDL 83mg/dl, HDL 40mg/dl, triglyceride 160mg/dl, total cholesterol 155mg/dl, urinalysis normal, Fasting blood sugar 5.8umol/L, ECG: abnormal regularisation, sinus arrhythmia, others normal; Echo : concentric left ventricular remodeling and trivial tricuspid regurgitation. I’m 36 year old, male, health assistant. No previous history of injury to my back. Never smoke before, never drink alcohol before, not promiscuous, I don’t fast, I also sleep well. I don’t lift heavy weight. The back pain is constantly there but not tender to touch and when it first started it was like a firing pain but now, it’s more like a dull ache, not relieved by rest or drugs. I started having headache with left eye ache also a month ago which only subsides with combination of amitryptilline and propanolol, and recur whenever I stop the drug for two days. Started loosing weight and having anorexia about two weeks ago but my doctors said it was due to my anxiety. Please can anyone help me out on this? Rehs, is it tender to touch? Does it changed when you twist your body or move? Such pain is most often caused by muscle tension. I can’t exclude a pinched spinal nerve or anything else, though. I have been facing this challange too.. I have this sharp pain on my upper left back and it doesn’t relieve me until my wife helps to massage it.. Its been like this for more than 5 years now, some said it might be driving and some said it might be my siting or walking position because most times i bend my head while walking..
Olayinka, so massage helps? If yes, it’s probably increased tension in the upper back muscles and your posture may be the cause. I have had severy muscular pain around and under the left scapula for years. What could it be? Beth, too little info. Ask an orthopedist. Tiffany, use your best intuition and decide if you want to go to the ER. You may want to visit your doctor first. hat my right hand is not ok sometimes feel numb when i wake up. when i cough I feel a sharp pain.kindly advice. Valerie, the back and hand symptoms may be related or not. The back pain triggered by cough might be caused by overstretched muscle at the side of the body (anterior serratus muscle) – usually due to lifting of heavy objects or repetitive sprints. Note, that back pain triggered by cough can be caused by pleurisy – an inflammation of the lung membrane. Hand numbness may or may not be related to back pain. A common cause of hand numbness in he morning is carpal tunnel syndrome triggered by bending the wrist during sleep. You may want to go to a doctor who can listen your lungs and perform a quick physical examination to rule out eventual spinal nerves involvement. Jean, your pain may be caused by a potentially serious disorder, so I suggest you to visit a doctor. Sandra, if pain is from the heart, aspirin will not likely help, so you might need more specific (prescribed) painkillers. If you think your symptoms worsened lately, go to a doctor. I have a upper back pain for almost a month, and I already consult it to a doctor and her diagnosis was “Muscle Pain” I tried to take pain reliever medicine however the pain still persist, I also undergo for a massage therapy but nothing happens. I experience also a chest pain but not all the time unlike on my upper back pain, I don’t have cough, and I didn’t experience shortness of breath. I smoke and I drunk and I’m currently working on a night shift, any advise regarding on what I feel right now because to be honest I’m getting paranoid because the pain is getting into my nerves. thank you so much and any advise will be highly appreciated. Sarah, to me, the chest pain you mentioned does not sound related to “muscle pain” in the back. I strongly suggest you to have a more extensive examination. You might need an X-ray. The pain may arise from the blood vessels or lymph nodes in the chest, from the sine, etc. Prepare an exact list of your symptoms with triggers and relievers, in the time order and discuss it with a doctor. I have pain at last right side ribs (middle) of chest. Radiates to middle back. Pain increases when I am in standing posture for long time. My job is continuously sitting in front of computer. Kindly suggest some remedy. Pandikumar, I don’t know what causes your pain, so I cannot recommend any remedy. You may want to visit a doctor who can tell if your pain arises from the gallbladder or other organ. For 6 weeks I’ve had stabbing pain in upper back right side, sometimes it feels like burning of the skin, this comes on very intermittently and only last for a few minutes, Very seldom do i have these symptoms at night or during sleep. Went to the doctors , she felt it was a inured mussel firing up the nerves, not sure she is right, gave me mussel relaxers and ibp. Bill, you may want to ask your doctor to arrange you an appointment with a neurologist or other specialist. I have pain behind my left eye, my left shoulder, my left chest. I also have diarrhea and GERD. Four weeks ago, I was diagnosed with bilateral pneumonia. After four antibiotics, my chest xray was clear. What could be causing my pain now? Might I mention that I also have terrible anxiety and suffer from panic attacks, and with my latest ailments, my panic attacks have spiked. Rebecca, from your experience you will probably know if those pains are something what happened to you before pneumonia. If not, you may want to see a doctor. Events started about four months ago with a warm feeling in my stomach as I lay in bed before going to sleep. Not burning or acid reflux. Six weeks ago I started having an empty or hollow feeling in my stomach about three hours after breakfast, with lots of gas. I could belch for a minute, one after another. Then pain starts in my spine about level with the bottom of my shoulder blades and radiates bi-laterally around my ribcage. Pain builds until it is debilitating. If I eat something, then lay on my vibrating heating pad in the recliner, pain subsides, but can reoccur. For the first time, it woke me up at 2:30 in the morning and I have not been able to get back to sleep. Can’t lie on either side or on my back; never been a tummy sleeper. Help. please. Craig, my first impression was that gas may build up in your stomach or bowel. Common causes are infection of the stomach with H. pylori, lactose intolerance, fructose malabsorption and intestinal parasites. You may want to see a doctor. I have very bad pain on the left side of my back level with the bottom of my rib cage. It started about two weeks ago. It always hurts but gets worse when i take deep breaths or bend over, or lie down. If i push on the spot the pain becomes unbearable. I did not do anything yo strain it so im not sure what it could be. But the pain is extremwly bad. Tyler, please visit a doctor soon. The left kidney and lung, spleen and colon are there. I used to wake up with such a bad pain in my back I felt crippled so I wouldn’t sleep in my bed for about 2 years I would fly asleep sitting up in a chair 1 day the pain was so bad in my right lung I went to the er I had a collapsed lung or phnemothorax for 2 years I suffered with swollen ankles and hands after a fairly easy treatment in the hospital of oxagyn and rest I never felt better go to the dr. Explain you symptoms they know or will find our for you what is going on don’t suffer like I did. I been having pain on my left side right below my rib cage and front left side right below my rib cage sometimes my left side what could be the problem. Darryl, you didn’t say what kind of pain, is it triggered by touching or moving and for how long do you have pain. There is spleen in the area you have described, but the pain could also arise from the bowel or muscles, for example. Hi Me and My Husband are at a loss at what is going on with him.Ok he’s been complaining for a while now how he has pain in his mid Back where the lungs are at and toward the top of his back and some chest pains that come an go, and another bit of info you might need hes 42 yrs old ,he is a smoker also a pck a day, Ok The night before last 5/10 we took him to the ER because he said he had tightness in his chest and pains in his chest as well which through him into a panic attack because he said he had to try and breath more just to breath, if that makes any sense, so we go to the er and they hooked him to a ekg machine, did blood work, and a chest xray and on top of all this his Blood pressure was high like 155/116 pulse was over 110 and the docs wasnt concerned about it and i was because my grandmother had a stroke and died from it because he BP was high. So After all the test came back they said everything was ok test look great you are healthy and sent him on his way with a BP prescription and thats it. He hadnt pulled no muscles or pinch any nerves. I see that some time Stress makes it worse hes trying to cut back on smoking. and he say the pain comes and goes he also said it feels like someone is sitting on his chest at the er, not someone heavy but small. He dont want to go back to the hospital and be told there is nothing wrong with him and waste gas. I am worried there is something going on and the Er nurses and doc cant find what goin on with him. Please Help.Kayla. oh he has no coughing going on, he also has serve acid reflux and o medicine for it. Kayla, there are 3 common things, among other, that can cause tightness in the chest as you described: anxiety, heart-related pain due to narrowed coronary arteries or arrhythmia, and acid reflux. Heart-related pain (angina pectoris) lasts less than 5 minutes at the time, is triggered by exercise and stress and is relieved by rest or nitroglycerin tablets. In the ER, they probably just did EKG and some other basic tests that excluded heart attack. These tests cannot tell if he has narrowed coronary arteries – he would need to have an investigation of his coronary arteries with contrast (coronary angiography) to check for that. Acid reflux can cause chest pain behind the breastbone with tightness. The pain is often triggered by lying down after the meal or at night. Smoking, alcohol, chocolate, some other foods and medicines can aggravate the reflux. I don’t know what to say. More detailed investigations would be needed to find out if the pain and high BP are heart-related. I have had a burning pain to the left of my spine, just below heart height. It has caused a number of symptoms thus far which recede and then appear in different parts of the body. Firstly I had groin pain, followed by severe pain in calf. I have had some respite in recent months, but currently I am experiencing muscle twitches in various parts of the body and a very sore forearm and wrist (feels similar to RSI). Symptoms are worse when sitting or lying down. This all began about a year ago when I talk a fall onto my chest. I am debating whether to go GP first or straight to Chiropractor.The pain in the back feels hot and achey, not acute. Bruno, I suggest you to arrange an appointment with an orthopedist. I have nausea, and it comes on immediately accompanied with pain in my upper center back, at my shoulder blades. Its central pain, does not radiate anywhere else. Burning or passing gas temporarily receives pressure in my back, and I can feel it when I breathe. It does not feel like muscle tenderness. I started to feel these symptoms after I wen bowling and ate pizza with some friends. I just want to know if I need medical attention, because I can’t watch my son in this condition. Amanda, I can’t exclude any serious condition, but heart-related pain, for example, lasts less than 5 minutes at the time and is nor relieved by passing gas. It sounds it can be trapped wind or heartburn or similar gastrointestinal condition, which may go on its own, but use your own best judgement about what to do. kiM, you might want to visit an orthopedist. i had a grand mal seizure and i fell straight back onto a hospital floor, seized 3-5 minutes. that was around 4/18. my back is still in pain and motrin isnt working. suggestions? Brandy, muscle strain heals on its own within few weeks, but pain from a herniated disc in the neck needs more time to go away. You may want to get check for a scapula, rib or spinal vertebra fracture. You can also check the article about the pain in the shoulder blades and scroll through possible causes. I had a pain in my left upper chest in about 2010 it was tested with scans and blood test and found to be stress after 6 weeks off work and placed on 75 mil of aspirin and statins with omerprisol tablets. I’m semi retired now and the pain has never gone, but recently as oct 2015 I have been getting stabbing pains in the same place but in the back going through. I came off all the tablets after reading about all the side effects and nothing has changed nothing got worse, nor better?. With this additional pain through from back too front do you thin this could be something like angina / Heart attack etc. Wallis, pain in angina pectoris typically lasts for less than 5 minutes at the time and can be quickly relieved by nitriglycerin tablets. Pain from nervousness/stress can mimic such pain. In case you ever had a mild heart attack, this would be obvious from the ECG. You may want to get your heart checked. The pain in angina is “behind the breastbone” and is heavy and squeezing. Stabbing pain often originates in the muscles or spinal nerves. I had a severe pain in right upper chest ran across my right shoulder and around my right upper back lasting probably a minute. Mildly acheing in upper right chest and shoulder now. Lou, I wouldn’t dare to make any suggestion from this description. If it continues, go to the doctor. I have hard pain in the side from my waist up to my shoulder blade on the left side. This is the second time in three months this has happened. I put heat on it and sit up for relief. When I move or turn over in bed the pain is excruciating. Can you tell me what may be going on. Linda, unless you think it’s from overstretching, I suggest to visit a doctor. I have had a pain in the left side of my back about 3 inches up from the start of my ribcage that has really troubled me for 2 days now. The pain came out of no where when I was just sitting at work, which is weird considering I do exercises and it didn’t begin when doing those activities. At first I thought it was a knot or muscle strain in my back but the pain started to change. I keep feeling a sharp pain almost convulsing pain, which I thought could be back spasms even though it wasn’t in my lower back, it was a little higher up. The pain subsided unless I took a deep breath or yawned, and the same sharp very concentrated pain would come back. To the point I almost couldn’t finish sentences and I became short of breathe. Its hard to pin point a spot of the pain it seems like it is almost moving a little bit. It is very painful, but I can’t seem to figure out what it is and and really have no idea. Sam, a rough rule is, if it is tender to touch, it’s usually from the muscles or skin (or rarely from a broken rib or shingles) and if it is not tender, it can be from internal organs, for example from an inflamed lung membrane (pleurisy). A recent exercise that involved arm swinging (running, swimming) or lifting objects with an extended arm can cause a strain of the serratus anterior muscle that attaches to the ribs on the side of the rib cage and to the inner border of the scapula. This can cause pain during deep breathing and using arms. So, first, you may want to ask someone to press over your back to see if it’s tender. So I already have confirmed interstitial cystitis, chronic pelvic pain disorder, I have had kidney stones develop off and on since 2008 ( my kidneys are lined with what looks like calcium sand) and a pituitary adenoma (prolactinoma). I also had a complete hysterectomy and an oopherectomy in three separate surgeries between 2011 and 2013 (I had endometriosis and pcos) The pain I have been experiencing is nothing like what I normally experience with those conditions. I got a stomach bug a few months ago and was had vomiting, diarrhea, fever and aching that lasted about a week. It seemed to wane and then I got a bad cold and severe pain in my ears. Started to feel better when I started with the nausea, vomiting and diarrhea again along with a fever off and on and tired all the time. The pain started on my right side about two weeks ago and I dismissed it at first but then it moved bro my back and just below my rib cage. The pain has gotten so bad at times I can’t walk and stay in bed and crawl to the bathroom to pee. It’s not constant a severe pain sometimes it is just a dull ache below my ribs center mast and right side and into my back. I have very little appetite and try to snack when I feel not bad. But this last week has been hell the pain under my ribs and into my back on that right side has become so intense that I am doubled over and moaning and can last for well over 30 minutes to an hour at a time. I am on pain meds for my other chronic problems so I have been taking my slow release as prescribed and been using my breakthrough or emergency when these bouts hit along when Tylenol won’t cut it (I have an allergy to NSAIDs) this sometimes helps but not enough that I can seem to function to do much around our home. The last 48 hours the pain is unlike anything I have felt and called for an appointment with my doctor but can’t get in until Monday (4 days away) i almost at had hubby take me to the ER last night as the pain attack I had was so bad and not stopping and Began making it hard to breathe. I tried to just breathe slowly but it was very hard to do so with the pain. After an hour and a half it subsided enough to make moving around possible again. Hubby is worried about me waiting to see the doctor till Monday. Trinity S, it could be a good idea if you just go to ER. I have severe lower back pain just under my rib cage. It seems worse on the left side. It moves up my sides and sometimes into my left shoulder. I have nasty pain that leaves me dizzy and nauseous in the center of my chest, about 4 or 5 inches below my sternum. Sitting is uncomfortable. Standing is worse. Laying down is unbearable. I’ve been to doctors. They say ‘all your blood work is fine’. My kidney function is low (55 GFR) and my Creatinine is a bit elevated (1.5) but nothing too huge. I just want to feel better. I also have ulcers and chronic mild gastritis. Jenn, did you have MRI of the spine or kidneys? Bonnie, when pain is predominantly on one side of the body and extends over such big area like upper back to thigh, then it may be good to find out if there is any neurological cause. Be sure to make a list of exact pain location, its triggers and relievers…that is the factual history of your pain, otherwise the doctor may not treat you seriously and suggest you it’s all in your head. Anyone have the same symptoms? My duaghter 18 over the last few months is now getting upper back pain between the shoulder blades but only after she eats..she also normally after eating has some pain in her throat and sometimes in her chest/stomach. It basically takes her out of wanting to do anything but soak in a hot bath. She gets the pain whether a dinner or lunch with only a sandwich. She has cut down on portions and is using Previcid recommended by her Dr but it is not working? Kim, I strongly suggest that she gets this checked by a gastroenterologist. It can be a throat or esophagus motility problem or acid reflux, but a gastroenterologist can tell the exact cause. I wake up with extreme pain in my lower back from left to right. Once out of bed, pain diminishes but becomes localized in the left side near back pelvic bone ( not sure what it is called). Pain on the inside of left arm where it bends, down to the thumb (fingers and hand are fine). Also have mild pain/discomfort between lower shoulder blades. This has been going on for a couple of weeks. Ibuprofen and changing positions throughout the day helps, but it comes back. Any thoughts on causes? Thanks for any help or suggestions, perhaps type of dr that may help. You can also check our article about arm pain. You can ask your primary doctor, which specialist to see; I think it could be a neurologist or orthopedist. Sorry..Idk if it’s relevant but I’m also concerned that both of my thighs are nonstop numb from sciatica (I’m guessing) & I have an itch on the inside low left thigh quite often. My pain dr either doesn’t know why or isn’t concerned. But everywhere I’ve looked online I only see where people have 1 numb thigh. I did see 1 case where it could be something more serious with my back that’s causing both to be numb. I’m also concerned if there’s some type of affect from the constant numbness! It’s been years now! Please help! Thanks again! Patty, if burping helps, it may mean you have gas in the stomach, so you may want to find out the cause (for example, H. pylori infection of the stomach or fructose malabsorption). You may also have gastric reflux. For numbness in the thighs, I suggest you arrange an appointment with a neurologist who can perform neurological examination and tell which nerves may be involved and what can be done. Long-term numbness suggests long-term nerve compression, which may cause permanent damage. I get really bad spasms between my shoulder blades & my chest. Usually drinking pop to help me burp good helps it go away. But the last few days it’s been almost constant in my back! I have been told by a chiropractor that my neck doesn’t curve like it should,I have muscle spasms in my middle back & have scoliosis on the bottom. From an mri I have been told I have sciatica, degenerative disc disease & a protruding disc. I’ve also been diagnosed with Fibromyalgia. I have dd sized breasts which I feel cause some of these spasms in middle back. It’s just been pretty painful the last few days & starting to worry me. Any info would be great! Thanks a bunch! Joan, the type of pain you have described–both the location and time course– can actually be caused by kidney stones. Blood test alone cannot exclude kidney stones, so you can ask a doctor to have an urine test and some imaging investigation, such as urography. I’ve had pain after eating, no matter what I eat, lose of appetite, my 4 and 3 year Olds eat 3 times as much as me, pain along my spine into my ribcage, nauseous, as well as tired feeling, sluggish fatigue, whatever you want to say. My blood tests are all kinds of messed up so they can’t pin point one thing. I need help. I’m miserable. I haven’t ate more than a whole meal combined in 2 weeks. Been suffering for 4 or 5 months just getting more severe. Pain under left shoulder, mid back, light chest pain, nausea, a little tingley in left arm past couple days need comment please. Shoulder blade feel completely drained by it it’s constant, can anyone help? Beth, I suggest you to visit your primary doctor or an orthopedist, because you need to get a diagnosis before you can know an appropriate treatment. Tony, an X-ray can show if there is something wrong with your spine. A herniated disc is possible, but also arthritis of the spine, for example. I am having severe back pain in the top middle part of my back / Lungs, The pain is starting to affect my chest have also started getting a pain on the right shoulder, This is starting to concern me as i am not medically trained. Can you please reply, I am always thinking its nothing to worry about, But the pain is getting worse as time goes on. John, it can be many things, but a doctor can tell more after a physical examination. It could be just the pain from tense back muscles, it can be inflammation of the lung membrane (pleurisy). I am having pain on my left side and back when I breathe in. It’s located between my hip and rib cage, so right in the middle of my abdomen and it goes to my back, when I breathe in an out, and idea of what this may be? I has a slight temp last night, but none today. Brittany, hard to say. If it’s sensitive to a light touch, it could be muscle strain. If you feel bloated, it can be from gas (splenic flexure syndrome). If you feel any unusual mass by deep palpation, it could be enlarged spleen. If you ever had an abdominal surgery or laparoscopy, they could be adhesions…It could be also kidney inflammation. If your symptoms continue, please visit a doctor. I get a sharp pain on my lower back from right to left all of a sudden. It lasted about 30 seconds to a min. Juan, I’m not sure if I can clearly imagine where your pain is. Such pain can be due to muscle spasm after exercise or bad posture. Kidney stones usually cause pain on one side at the time only. Couple of days back i started having severe pains, it all happened sudden and had persisted. This pain kept re-occuring about bedtime / midnights and by morning i get relieved entirely only to start again in the midnight. The pain is so severe that it affect my sleep. Waheed, if you think you have experienced a severe psychological stress, it can be stress-related muscle pain. If you were dong some physical work, lifting heavy objects, it can be myofascial pain syndrome. Anyway, your symptoms sound severe enough to me that I wouldn’t just narrow them down to stress, so I strongly suggest you to get checked this by a doctor. It could be a problem with a spinal cord, for example. Kirsty, such pain can actually be muscular but I can’t say yes or no from here. If you think it is a neurological or rheumatological problem try to arrange an appointment with appropriate specialist. Martin, symptoms that affect various parts of the body are often caused by a systemic diseases, like flu, rheumatoid arthritis, etc. From the symptoms you mentioned I can’t narrow down possible causes any further. I strongly suggest you to visit your doctor. Karen, if they said you have kidney stones, ask them for treatment options for stones. Joyce, I’m not sure. In case you were lifting something heavy, it could be muscle strain, but if not you may want to see a doctor. Zach, no matter how, you need to see a doctor. I can’t give any information that would help relieve your pain. It is possible something is happening in your gastrointestinal tract, but a doctor needs to perform some investigation to see what it is. Betty, congested nose and pain in upper back during breathing sounds like pleurisy – an inflammation of the lung membrane, which is often associated with pneumonia You can check symptoms of pneumonia here: http://www.ehealthstar.com/conditions/pneumonia/symptoms-how-does-it-feel-like. A doctor can listen your lungs and do some tests. If it comes out you have viral pneumonia, you may need no medications. But a doctor can tell. Marie, it is possible that the problem is in your stomach (including acid reflux). Hello , I keep getting this rash on my mid left back in the same spot . It becomes very itchy and swells up . When I take a cold shower or apply ice to it tends to go down but it occurs 2-3 times a day now. I have been eating the same , using the same clothing detergents , so I not sure what it could be or what else to do . Krysta, if the rash is pinkish and looks like hives (urticaria) and it completely disappears between the occurrences, then it is probably an allergic reaction to something what touches your skin. I don’t think it’s an allergy to food, but can’t exclude this. Severe stress can also cause hives, which would be probably more diffuse, though. In “cholinergic urticaria” hives can be caused merely by physical contact or change in temperature. An insect bite could be possibly followed by allergic reactions. An allergologist can perform the skin prick test. Elize, does the pain radiate down your outer or inner side of the arm and how far down it goes? Any tingling or numbness? — outer side of the arm can be from a herniated disc in the neck. Such pain is often relived when you put your left hand on the top of the head. X-ray cannot reveal a herniated disc, but MRI can. —- myofascial pain from overuse of the upper back muscles or bad posture. James, pain aggravated by breathing and moving the arms can be from muscle strain in your back and abdomen. Such pain in general improves with time on its own. If your back and abdomen are sensitive to touch – this further speaks for muscle strain. I by no means can exclude eventual nerve damage from herniated disc. Pain in herniated disc in the neck is aggravated by extending the neck backwards and relieved by putting the hand on the affected side on the top of the head. Pain from the herniated disc in the lower back is aggravated by prolonged sitting and relieved by walking. I have constant aching in my head , neck , ear, shoulder , arm and leg all down my right side . Constant headache. Doctors constantly just says it’s stress . Any advice ? Liza, if you believe it’s an underlying disease you may want to arrange an appointment with a neurologist. Chizzy, I’m not sure, it could be a viral infection, but you may want to see a doctor. Ian, I’m not sure if I understand where exactly do you feel the pain. This is very informative. But am still searching for the right kind of disease I have.. My back pain is only felt in the morning. Everyday when I wake up in the morning I feel this pain starting from My lower shoulder blades up to my shoulders while I’m still lying. But when I rise up I feel nothing and I can move normally. My health history is this: I have undergone 3 Caesarean Section, 1 surgery for hysterectomy. I am also diagnosed to have gall stones.. Is the pain that I am experiencing now is brought about by my gall stones?pls give medical explanation. Thank you! Mercedita, it does not sound to me as a pain from the gallbladder. Gallbladder pain comes in waves as a prolonged (minutes to hours) cramp in the upper right abdomen and can radiate to the right shoulder blade or shoulder. 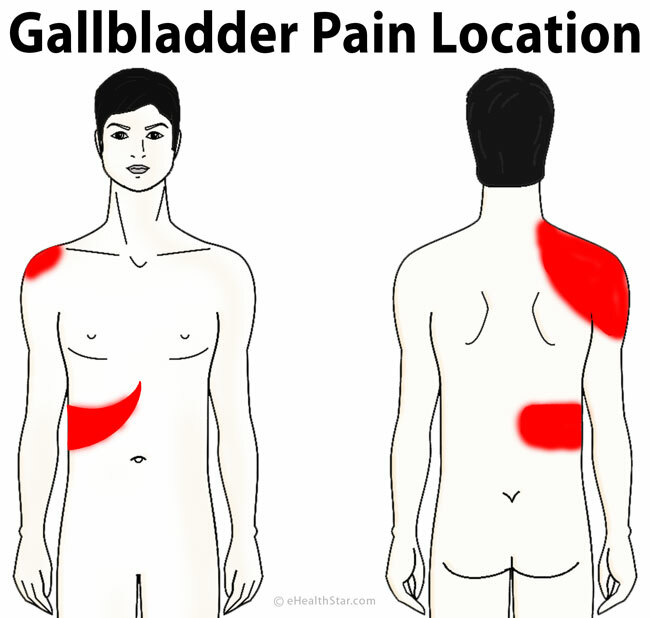 Gallbladder pain is usually not affected by body position, like getting up from bed. Could it be muscle strain from overstretching or injury? A herniated disc in the neck can cause pain in shoulder blade (usually on one side), shoulder and upper arm. Another possibility are adhesions in the abdominal cavity (due to surgeries) that could pull on your diaphragm muscle and cause referred pain in your shoulder blades. 1. Muscle pain would be aggravated by pressing on the upper back muscles or bending the neck (chin-to-chest) or moving your arams. Muscle pain can occur if you have very hard or very soft mattress or a high pillow, or if you are stressed or have bad posture during prolonged sitting. 2. Pain from herniated disc would be aggravated by extending the neck backwards and then turning the head to one or other side. 3. Pain from the gas in the intestine. You may try a low-FODMAP diet and see if it helps (you should feel better within a week). I want to say, you may try to exclude some pain causes on your own and if you still do not have an idea, you can ask a doctor (orthopedist or gastroenterologist) who can tell more after physical examination. Idowu from Nigeria, I am just 50 years of age, I have pains in my chest and below the rib cage, and it radiates to the left side few fays ago, and also pains at my left leg but at the upper region, and any I went to toilet to discharged waist, I well feel relieved. Idowu, it sounds you might have pneumonia. Some types of pneumonia cause only a low-grade fever or no fever. A doctor can give you antibiotics. If you do not get antibiotics, you might have problems for several weeks or even months. You may also have some other problem, so if possible, go to a doctor. Been having this numbness tingley feeling in my back for about a month. Wenever i start moving it feels like it tightens up. Bt seems to alternate sides and occurs wen i start moving my arms alot to start work. Im scared because the er doc ran test n xray blood work and it revealed nothing any advice would help. I get very anxious wen i start to feel it come on please help i never felt this way before. Mario, upper or lower back? A neurologist or orthopedist can help. An X-ray cannot show a herniated disc, for example, but an MRI can. But a doctor can say which, if any, investigation you need. More in the middle of my back i have to say and comes n goes wen i start to get active bt a real numbness n tingle feeling than pain. And feels very tight. If im looking down at something i can start to feel it if im layn down im fine and also if im not doin much im ok. Bt once i get moving it starts again. Mario, tingling and numbness occur when nerves are involved. I strongly recommend you to visit a neurologist. Joy, it sounds like a neurological problem; a neurologist can give a diagnosis. Pink, if you once had the problem with the discs in your lumbar spine you may now have it in the thoracic spine. Pain from acid reflux can appear behind the breastbone but also in the middle of the back. You wold likely feel a sour taste in the throat or mouth, though. Heart related pain (angina pectoris) is triggered by stress, exercise or cold and can appear behind the breastbone, between the shoulder blades or in the left shoulder blade and can radiate down the inside of the left arm. If you had the problems with your spine before, you may want to visit an orthopedist. What are the reasons for re-collapse of vetebra after kyphoplasty? Gopesh, the surgeon can explain this. I have been experiencing tenderness under my right armpit (toward the bottom of the armpit) and right, middle back below the shoulder blade and away from the spine. It feels like it is bruised and can be centralized to a single point, yet there is no visible external bruising present. I had originally thought it was backne or an ingrown hair, but the bruised feeling has remained for about two weeks. Ibuprofen doesn’t seem to remove the tenderness feeling. Cold and hot compressed do provide temporary relief. I’ve had no other symptoms – no vomitting, nausea, fever, strange pee color, nothing. I have been lifting a few boxes in preparation for an upcoming move and wonder if maybe I just strained a muscle? BP, you might overstretched the serratus anterior muscle. I mention it briefly above in the article. A herniated disc usually causes pain either in the shoulder and arm or lower back and leg, very rarely in the middle back or armpit. Belinda, it sounds like a pneumonia or some other lung disorder. Greyish facial color seems to be from lack of oxygen in the blood. Please go to the doctor soon. i had back pain just below my shoulder (i think its near on my back ribs,barely could located which is the main cause of my pain) and whenever i laid down, certain place on my back hurt so much and it moved to my left chest and badly hurt me and i can’t hardly breathe. same thing happen if i moved my hand on the left left or right side. and i had severe headache at the same time. i wonder if it related with the heart infection i was told on 2013? Lyn, I don’t think I can help much here. I strongly suggest you to see a doctor. Hello I’m 42 years old.ive been having pain on.my back right side and towards under the arm..it hurts to take a deep breath.its been like this for months now.I’m so tired of this pain.my nurse practitioner.we haven did chest exray,a echo ultrasound, blood test urine test I keep having a uti ive been on antibiotics twice so far they did a Ct scan..please help. christy, have you been lifting something heavy with the right arm or sprinting? Nilli, I can’t comment much from so limited information. He can go to a doctor – a simple examination can reveal if he needs any treatment or not. I am 26 year old female, I am fairly active when not in pain. In October 2015 I went to my doctor as emergency appointment with excruciating pain in my back on the right side just under my ribs, radiating up to bottom of shoulder blade, when I breathed in it felt even worse so felt I needed to take shallow breaths, after examination I was advised the muscle was in spasm and to apply mixture of hot and cold compression, the pain lasted for two days, reducing my mobility and general ability. 4 days ago the exact same thing happened however on my left side, I did not return to the doctor just followed the previous advice given, again the pain subsided after 2-3 days, however I have just been woken by the same pain but has now moved across to my right shoulder blade area again pain when breathing and general movement. I had previously (Sep 15) been referred for physiotherapy by my GP after reoccurring lower back pain which we think may be related to exercise, my first appointment is in two weeks so hoping to get more answers. I have been under considerable stress recently however struggle to see how such excruciating physical pain can come from psychology stress. I am concerned that the area of pain keeps shifting particularly when since the initial pain began 4 days ago all I have tried to do is relax the muscles. Suzie, were you lifting any heavy objects recently, sprinting or using the arms excessively? In this case the serratus anterior muscle can get irritated and cause such pain. As for stress: I believe walking in general can help in lower and upper back pain (as opposed to constant sitting). You may want to deal with some stressful situations: accept some and solve them or refuse those you feel they are not your responsibility to deal with. Hi, my mother suffered a D12, L1 fracture after falling in bathroom 2 yrs back, and underwent kyphoplasty at L1. After arnd 4-6 months of injury she is having pain in the right upper abdomen(just below chest). Recent CT shows “collapse of L1 vertebrae with a hyperdense material within likely bone cement”. She also feels numbness in right hand palm and fingers sometimes and it stays for 15 mins on avg and very discomforting. Gopesh, an injury of a L1 vertebra can cause pain in the right upper abdomen, but not numbness in a hand. The numbness in the right hand could result from another injury higher in the thoracic part of the spine or, for example, from an injury of the wrist. I suggest her to visit a doctor. Is physiotherapy benificial for her? She would need to get a diagnosis of her hand numbness. If it comes out that she has carpal tunnel syndrome, for example, then the initial treatment includes rest and, eventually, a brace or some painkillers. It is an orthopedist who can tell, if exercises for the pain in the trunk can help. She might need to improve her sitting position and avoid lifting heavy loads. Physiotherapy is intended to strengthen back muscles when the pain subsides. But i was talking about the pain in right abdomen which she is having. Is physiotherapy gonna help her in anyway for that? Gopesh, I don’t know. A doctor can say what is the most likely cause of pain: a collapsed vertebra, a pinched nerve, or a complication of surgery. Without knowing this, it’s not possible to give any meaningful recommendation. I would say, she should not try physiotherapy unless a doctor approves it. Hi, hope I’m not wasting anyone’s time. 3 year old injury, 50% compression fracture of L1. 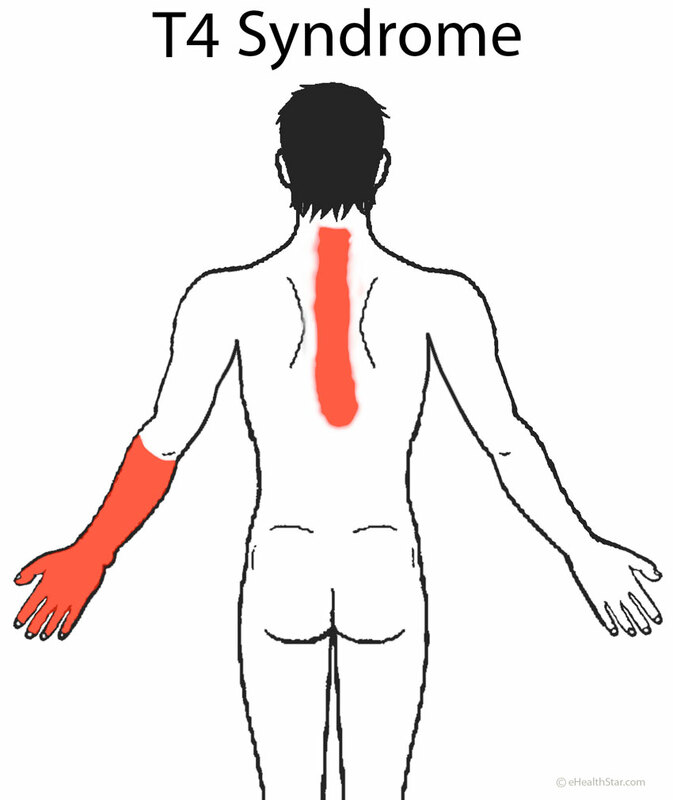 New pain in upper back right side ( between spine and shoulder blade). Always radiates to neck and sometimes right elbow area as well ( no tingling just deep pain ). Is only present with rest or sleep (every day). It hasn’t impeded my work ( construction ). Goes away with movement but after about an hour of rest it begins as a sharp pain and then continues. It’s only been about 3-4 weeks of this but I would feel awkward seeing a doctor for a strain or pull. By the way I don’t remember ever doing anything to cause a strain. Norco and robaxin do very little to curb this pain ( on hand for L1 pain if needed ). Do you see cause for concern, haven’t used heat or cold compresses. I’ve had bad experiences with using them. 42 yr old male. Steve D, what was the cause of the compression injury of L1? – Pain relief after you put your hand at the top of your head speaks for a pinched nerve in the neck. (The absence of pain does not speak for the absence of pinched nerve, though). – Spurling’s tests: You extend your neck back and then turn your head toward the painful side: Pain while doing this speaks for a pinched nerve in the neck. In strained muscle, bending the neck chin-to-chest would trigger pain in the back. Strained muscle in the back does not typically cause pain that would radiate down the arm. Shrugging or squeezing the shoulder blades would also trigger pain in the strained muscle, but less likely pain doe to a pinched nerve. I have degenerative disc disease. I had a disc replacement fusion from l4 to l6. Disc c1 to c4 is also bad. My problem is thoracic pain. I am now feeling pain in my right side behind the ribs and it wraps around. Stabbing pain especially with deep breaths. I have no right kidney or gall bladder. Could a disc be causing the pain in my side? Karla, herniated cervical discs can cause pain around the shoulder girdle and in an arm. In our article about herniated discs http://www.ehealthstar.com/conditions/bulging-herniated-disc you can check which discs can cause in which part of the body. The pain in the chest that wraps around could arise from a herniated disc in your thoracic spine, but this is quite rare. Bone spurs due to osteoarthritis can also pinch a spinal nerve. So, the problem can be in a disc, vertebra or joints between vertebra. Your pain does have a pattern of a pinched spinal nerve. Hi a couple of months ago I had bronchitis and doc gave me some antibiotics and a couple days later I felt like kindeys were on fire,I do have kidney stones in both kidneys, but er said I had diverticulitis. Went to gastologist and had colonoscopy done, and all was well. For 3 months now I get a dull pain in middle of back that feels like radiates to both right and left flank which pain ibecoms excruciating and it makes it hard to breathe. Pain goes up to shoulders and neck then I’m so exhausted my head and jaw start hurting. Sometimes I get a sharp stabbing pain on right front side middle.. I know it is not kidney stones moving because I know what that feels like. It happens randomly, if I stand for 5 min its excruciating, then next day I stand and no problem. Sitting or walking same thing. I have good days and bad days. It’s not constant. I’ve been to urologist, primary doc, gasterologist, and so tired of being in pain when episodes occur. I’ve been taking, advil, aleve, aspirin and taking hot baths, and stretching back. I sit at work, and try to get up every hour to stretch back. I’m in my 50s. Also I have no gall bladder, appendix and had hysterectomy. Need some advise, PLEASE!!!!!! Thank you. What kind of doctor should I see? I need to see one that will listen to me, but not sure if I need to see another urologist or gasterologist? Or another kind if doctor. Please advise,. And yes according to the link, it sounds exactly like somethings going on with my kidneys. Knew I wasn’t going crazy. Thank you again. Jenna, a doctor that deals with kidneys is called a nephrologist. An urologist usually deals with lower urinary tract (bladder, urethra), but these terms can be used interchangeably. So, if you believe your pain arises from kidneys, it’s then a “kidney doctor” you can see. Great and thank you. I never heard of a nephrologist before, but will look one up. Happy New Year. Hi, I have pain under my right shoulder more in the top of the runs only when stretching with my arms extended above my head. It is a sudden, intense sharp, stabbing like pain that double me over. I have no idea what could cause that but it locks my whole right side up when it happens and takes a few seconds to unlock so I can position myself differently. Haley, it is possible you have a problem with the shoulder joint or the muscles around it (frozen shoulder, calcific tendinitis…). Few of these conditions are described here: http://www.ehealthstar.com/shoulder-blade-pain.php#shoulder An orthopedist can give you a proper diagnosis – without this it is hard to say what to do. Have had a sharp, stabbing pain in my left middle back for approx 2.5 years. Pain gets worse as the day goes on from constant sitting in a chair, and sometimes once the pain gets really bad it feels as if the area begins tingling and then goes numb. Has gotten much worse recently, and have also had tingling in my arms for the past few days. Do you know what this could be? Sarah, it is possible that you have a pinched nerve in your thoracic and/or neck spine from some reason (herniated disc or a broken vertebra due to osteoporosis?). Another similar condition to think of is “T4 syndrome.” I strongly suggest you to visit an orthopedist or neurologist soon. I have the same or similar conditions to all of the above people’s. Have been through many different test, all of which came w a diagnoses of gastroparesis. Perhaps it may be a condition, to a different, multifaceted problem. It began around 8 yrs ago…. I vomited profusely for two consecutive yrs. The pain in my abdominal area, fluctuates; but, to me; it seems the only “constant” since this began is the pain below my left breast. It, in fact is worsening as time goes on. Sometimes I throw without any warning at all…. not even regurgitation?? I’m so tired of Drs and seemingly getting nowhere. It’s affecting my family life, marriage, all aspects. At the end of my rope. Julie, gastroparesis has a long list of possible causes and the doctors that gave you this diagnosis probably gave you some suggestions, din’t they? What happened 8 years ago? Any stressful event? I am 40 years old and was diagnosed with moderate scoliosis when I was 9. I have had pain from that ever since. My left leg is also 1/4″ shorter than the right and I was born with both my feet pigeon-toed. I self corrected that, but when I sleep, they still turn inward. I first got arthritis in my mid 20s and had knee surgery for it when I was 29. My back pain has been steadily getting worse for the past three years. It started in my lower back and I assume it is because I was never able to lose my post pregnancy weight after having my last child in 1999. It started at night and would go away when I got up. That lasted for about a year before it began hurting all day and then this past year it has begun making my abdomen hurt. I now cannot eat much in one sitting before I feel full and it starts hurting. About 6 months ago, my upper back and neck started hurting. When I was 29, I had mild whiplash and I am thinking the pain is from that, but it is now giving me headaches and waking me up at night. The pain is reduced somewhat by massage and electric impulse and stretching. I put a pillow between my knees and a wedge under the head of the bed and this also helps somewhat. I also have a neck pillow that helps initially, but around 2 or 3 am it gets excruciating that I have to go back to my regular tempurpedic pillow. I tried beginner yoga poses, but it hurt so much I had to quit. Please, please help me! Mary, you would need to get an official diagnosis. Scoliosis and leg length discrepancy alone can cause pain, but when pain becomes more widespread it can be from arthritis of the spine, for example. If walking helps, try to walk. If sitting increases pain, avoid sitting. Other than that, you may want to discuss with your doctor about having an MRI of your spine. I have pain just like itching on the left side of upper back. Its happen Times to times not happen regularly.plz tell me what are the problem and hoe to treat. Raj, one possible cause is a herniated disc in the neck spine, but I can’t say is it or not. A doctor would need to perform a physical examination to find out is it a problem with nerves, muscles or something other. Hi there and Merry Christmas. For the past year and a half I wake up in the middle of the night with left flank pain. I am a side sleeper so when I got to sleep on either side it doesn’t typically bother me however after a few hours I will wake up to moderate to severe flank pain in my back. I have to get up and use the restroom and that tends to alleviate some of the pain as pressure is no longer there however I will be in pain for atleast another hour before it subsides. Here recently I have noticed the pain start to become consistent throughout the day however it isn’t as bad as when I sleep. My first thought was a kidney stone, as I have had 2 (one this year in January) however my urologist did a MRI and found nothing and believes it is musculoskeletal and left it at that.. Which I know absolutely nothing about. If it is a pinched nerve I don’t know what to do to fix it or why it would be isolated to one area of my back. I even got a new matress and that didnt help. Any help is greatly appreciated because I’m about to loose it over here. Stacy, how old are you, what is your daily job and how active are you? Is the pain in one or both flanks and where exactly? Does it radiate anywhere? Is it relieved after urinating or having a bowel movement? Unless you have a severe osteoporosis or cancer, or you had an injury, which does not sound likely from the symptoms you’ve mentioned, the pinched nerve in the middle back is unlikely. A rare cause of pain that mimic pinched nerve is a benign nerve tumor of a spinal nerve called schwannoma – an MRI of the spine can reveal that. Theoretically, a kidney stone could temporarily block an ureter and cause a build up of the urine in a kidney on one side, which could cause pain, which would be relieved by urination, but you said MRI showed no stones, so I’m not really sure. A buildup of gas in the colon can cause upper left (or right) abdominal pain that can radiate to the left (or right) shoulder blade. Such pain could be relieved by a bowel movement. Musculoskeletal pain is pain from muscles, tendons or joints. The most common causes are increased muscle tension due to physical or psychological stress, prolonged sitting, bad posture, leg length discrepancy…In this type of pain, your back muscles would be tender and by careful palpation you might detect one or more muscle knots. Thank you for replying. I am a 29 year old female and work at a corporate office, so I sit all day. I was pretty active, worked out 3-4 times a week with a trainer, but have laxed on that the last couple of months. It does tend to feel better when I urinate or have a bowel movement, but more so that pressure is relieved because the pain is still there… It is as if my left side flank area can’t withstand pressure on it and it is near my kidney. Both stones that I had were on my left side and my ureter tube was too narrow so they had to blast them. I’m starting to notice it when I sit at work after 2 or 3 hours. However as stated the MRI didnt show a stone, but did show a cyst on my left kidney that my urologist wasn’t concerned about. He said it was small in size and shouldnt cause pain. Other than the left flank pain, my lower back just feels sore. My abdomin doesn’t hurt or anything. I appreciate it! Stacy, I don’t know what to say. If the source of your pain is the left kidney, the pain should not be significantly affected by changing your body position (bending, twisting, moving arms), but if the source are your lower back muscles, the pain would be affected by the body movements. In the later case, some stretching exercises, walking and having some short pauses from sitting may help. In a kidney problem, drinking a lot of fluid could trigger pain, but in muscle problems it would not. So you may want to experiment with pain triggers and relievers. I would not exclude kidneys as a cause of your pain. If the pain persist, at some later time, you may want to discuss with your doctor about having more detailed investigation of your kidneys, such as pyelography or urography. Kitna, would you say that “prolonged rest” (how long?) always helps to relieve pain? I mean, do you think it happens like a cause and effect: rest relieves pain? If so, the problem may be mechanical, that is related to muscles, spine or spinal nerves. If you are not sure if rest is directly related to pain relief, it is still possible your pain has something with gallbladder *OR* bile ducts. In this article you can see that gallbladder or bile duct pain can occur without symptoms. One possible cause is sphincter of Oddi dysfunction (SOD). Such pain is sometimes worse after eating. Is pain triggered by body movements? Is the pain worse if you twist your back, bend, lift the arms or lie in a certain position? If yes, this speaks more for a problem with nerves or muscles than with internal organs. Kitna, what are pain triggers and relievers, did you have any injury, what type of work do you have, how long your symptoms last, how old are you…? Hi I have a severe burning stabbing itching constant pain in my left mid back. It never goes away or move or subside. I do not have fever cough or loss of appetite or weight loss just this excruciating highly uncomfortable continuous pain. Fredericka, the only thing I can say is that a doctor, after a physical examination, can be able to say if the problem is in the muscles, nerves or spine or in the internal organs. i have severe pains under my left breast which radiates to my upper back and increases when i eat. im currently on zinnat twice daily for cystitis, docs dont seem to give much answer as i hv done ivu, ultra sound scan and even chest xray that shows a mild cardiomegaly. Im confused as to what to do. I hv taken all kinds of drug and i keep having different symbtoms at all times. Mean while the last ultra scan was done on the 8th of this months and it was recorded that the were ok and other things fine but that the bladder has an irregular outline. pls help! Christie, pain from the heart tends to radiate into the left shoulder blade and down the inside of the left arm. Such pain would be triggered not only by eating bit also by stress or exercise. I can’t imagine where your back pain is. Splenic flexure syndrome (a form of irritable bowel syndrome) can cause pain in the upper left abdomen, left side of the chest and left shoulder blade and can be worse after eating. kirsty, a doctor can say what can be done. stephanie, I can’t quite imagine where you feel the pain and what exactly relieves it. Steve, herniated disc at T6-7 level can actually cause pinched nerve and pain in the area you’ve described. If the disc is herniated on both sides, it can cause pain on both sides, but a doctor who can explain your MRI image can say if this is the case. Try to observe your pain and write down which body moves or positions (bending, twisting the trunk, lying, sitting…) trigger or relieve the pain and discuss this with your doctor. If it comes out that the herniated disc is the actual cause of your pain, you can discuss with your doctor about surgery again. Note, that changes that look mild on MRI can cause severe pain and vice versa. Visit someone with a PEMF machine. Where are you located? Look into acupuncture as well. Hi i’v had pain in my back (right lung) also right shoulder going up kneck and down right arm. I feel tired and sick also lost appetite. Really worried. Angie, I recommend you to visit a doctor soon. Loss of appetite, tiredness and feeling sick do not likely occur just because of muscle or nerve pain. Whatever the cause it, by early treatment you can often expect much better outcome. I need help, I’ve been suffering for 5 months now with doctors confused as to what it is, they’ve said cancer, but not large enought cluster of blast cells to say it’s active, I have severe stomach pain right after I eat for 4 to 6 hours, can barely est, my 4 year old eats 2 times as much as me, middle of my back into my ribcage feels like someone is stabbing me, makes it hard to breathe I feel like, I’ve been running a constant 99 to 100 for the past 5 months, I don’t have a gullbladder so that isn’t the problem had it removed 5 years ago. I just need some type of help as to what this could be. I’m sick of being sick all the time, as well as tired and sluggish, and fatigued. I wanna feel good again. Elisa, in which organ cancer is suspected? Stomach? How old are you, do you smoke? One thing that can help is to eat more liquid food, which goes through the stomach faster and may trigger less pain. Hey! I have been having pain in my right side at the waist line to the middle of my back. I lifted heavy boxes three weeks ago. It is worse at night when I sleep constant pain. My right side aches. Do not have gall bladder or appendeix. Hope it is just a pulled muscle but scared it might be more. Jill, if it has been already 3 weeks, you may want to go to a doctor. A simple muscle strain may not last that long. I lay on my back and wake up with a pain in my back just above my waist. I get up to urinate and once I’m up and out of bed the pain goes. Doris, without knowing more exact pain location I can’t say much. Prolonged sitting tends to aggravate and walking helps relieve pain from degenerated disc. Avoid lifting and carrying heavy things. This alone often helps. I have waves of pain in my lower back and its usually when I’m standing longer then 30 mins. It feels like I need to pop my back and it makes me instantly nauseas and cant catch my breath until I pop my back and release what feels like fluid. Or if I sit down or bend over in a sitting position it relives the pain as well. I have other systems as well but this is one of the main ones that I’m conserved about. So I was curious of what your advice is. Samantha, it is much easier to make conclusions from a combinations of symptoms than from a single one. Where exactly do you feel fluid? Can you detect this by hands? After pain relief, fluid sensation goes away?